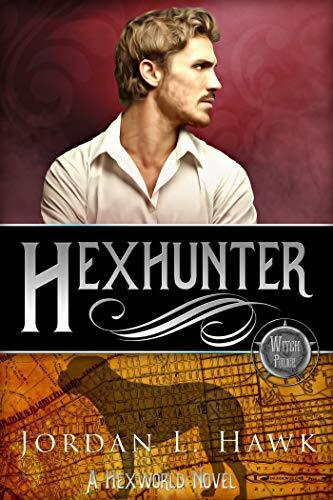 Dana reviews Hexhunter (Hexworld, Book 4) by Jordan L. Hawk. (Published February 8, 2019, 244 pages) A copy was provided in exchange for an honest review. To read Bethany’s audioreview of Hexbreaker (Hexworld, #1) click here. To read Marc’s review of The 13th Hex (Hexworld, #0.5) and Hexbreaker (Hexworld, #1) click here. To read the duo review of Hexmaker (Hexworld, #2) click here. To read the review of Hexslayer (Hexworld, #3) click here. With every book I read by Jordan L. Hawk I become a bigger fan. Their stories always have a touch of paranormal but take place in a world like ours – present day and in history. With a little wiggle room, the author tries to give an accurate portrait of the time the story takes place. Their characters are unique and always lovable even when they are obnoxious or stand-offish. Each story is so enjoyable and interesting. The Hexworld series takes place the last year or two of the 1800’s into 1900. There are witches who use their magic to charge hexes with the help of shape-shifting familiars. There is even the MWP, a police force that deals with magic and witches. So far all of the previous couples have had a character who worked there. And in this book, the character is Isaac. In a previous book he was hurt and forced to use his magic for nefarious purposes. Since then he hadn’t used his familiar form in so long, he had doubts he could change shape. One of the police officers that saved him was Bill Quigley. Bill is a mediocre witch and works for the non-magic police department. Both have had their eye on each other for some time, but fear and doubt have kept them apart. Bill is just a really good guy. There is absolutely nothing to not like about him. His family history is a bit shady but since he hardly knows them, it hasn’t affected him. Isaac is also a good guy but he is more damaged. He is losing connection with his animal, he pushes away Bill, he is afraid to use magic, all because of what happened to him. He has closed himself off from most of life. It takes a moment of danger for him to finally give Bill a chance, but even then he still holds a part of himself back. Missing orphans, and familiars that are have animal traits even in their human form have Bill and Isaac investigating and fighting a surprise former enemy, along with an owl familiar named Sionn. Dominic and Rook, Tom and Cicero, Owen and Mal, Jamie and Nick, also join in the adventure. It was so awesome to see all the previous main characters again. I was just filled with excitement as they worked together together to solve a mystery featuring unknown/lost hexes. As the series moves forward, each book seems to deal with old magic being brought back to life. The level of corruption gets deeper and the ranks of the individuals involved keep getting higher. I can’t wait to see what happens in the next book and how far things will go before all the bad guys get exposed. I think in a previous review I mentioned that two men didn’t seem to be such a taboo relationship for that time as it would have been in reality. If I didn’t, I’ve said it now. There is a lot of inequality between witches and familiars, but I hadn’t noticed a lot of raised eyebrows at homosexual relationships until this book. For the first time a nasty side character let out his dislike for same-sexed couples and his distaste winds up damaging a lot of people in different ways. This was just something I felt was different in this book as well as for the first time, a familiar chose to bond with someone who wasn’t “his” witch. Generally the familiars bond with someone whose magic pulls on theirs. I honestly love the whole idea of fated mates who are just meant to be together by some bond from whatever higher power. But in this case, I really appreciated that this wasn’t just about creating stronger magic when deciding to come together. It was a deliberate choice, choosing the person they wanted to be linked with, and that was kind of a relief for Isaac after all he had been through. All in all, it was another great book in this series. I find myself impatient for the next book already, and I am sure I am in for a wait. Jordan L. Hawk just has too many fantastic series to check out. I would most definitely recommend this book, this series, or any other book by this author. If you haven’t read their books yet, you need to. If you want to contact Jordan, click here for Facebook, Twitter, or Pinterest, or send an email. It sounds like I have to add another author to my want-to-read list! I am also pondering whether the cats destroying the house has anything to do with the beer brewing, lol.